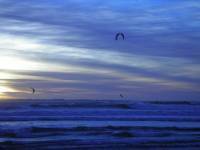 The south-easter wind that blows along the Atlantic seaboard is ideal for Kite Surfing. The best areas are along the beaches in Milnerton and Bloubergstrand, attracting both locals and foreigners in search of strong winds. There are a few shops conveniently situated in Blouberg where you can buy and hire equipment as well as book lessons.